With a racing version of the new Audi RS 3 that made its world debut at the Paris Motor Show, Audi Sport customer racing will extend its offering in customer sport starting in the 2017 season. The TCR version of the Audi RS 3 sedan puts customer sport at Audi on an even broader base. "Audi has been active in motorsport on the highest level for generations," says Stephan Winkelmann, Managing Director at Audi Sport with responsibility for the Audi R and RS models which Audi sells under the "Audi Sport" label. "With the Audi R8 LMS, Audi Sport customer racing, in a very short time, managed to build a successful customer sport program alongside the factory commitments in the WEC and the DTM. The Audi R8 LMS has since become the market leader in its segment. We have the same plans for the Audi RS 3 LMS, which offers customers an attractive opportunity to get started in fascinating Audi racing." The Audi RS 3 LMS is being developed by Audi Sport customer racing for the TCR category which is still relatively new. In addition to an international TCR series, with some of its races being held as part of the FIA Formula One World Championship supporting program, more and more national racing series for TCR touring cars are being founded. Even major endurance events such as the 24 Hours of Nürburgring are now including TCR classes. "The TCR market has even larger potential than that of the GT3 category," says Chris Reinke, Head of Audi Sport customer racing. "In 2016, there were ten TCR series with races in 18 countries, and more and more series are being added. With the TCR version of the RS 3 we're also reaching countries where no GT3 races are held. The costs for a TCR race car are very low. As a result, we're going to win new customers for Audi Sport as well. In terms of support and parts supply, they'll benefit from the experiences we've been gathering with the Audi R8 LMS since 2009, which our GT3 customers have come to appreciate." The Audi RS 3 LMS accelerates from 0 to 100 km/h in about 4.5 seconds and achieves a top speed of about 240 km/h. In TCR trim, the proven four-cylinder two-liter TFSI engine delivers 243 kW (330 hp). In terms of safety, Audi Sport customer racing is not making any compromises. The extensive safety package includes an FIA-conformant safety fuel tank, a racing safety cell, the PS3 safety seat, FIA safety nets on both sides of the seat and a rescue hatch in the roof like the one used in the Audi R8 LMS. 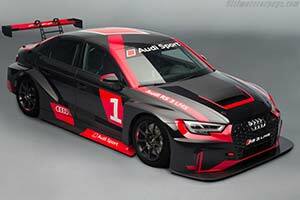 Audi Sport customer racing will start delivering the first Audi RS 3 LMS cars to customers this December, in time before the seasons of the major TCR racing series open in 2017. The purchase price is 129,000 euros (plus VAT) for the TCR version with a sequential six-speed racing transmission and 99,000 euros (plus VAT) for a club sport version.